Note: Catch up on all news about FirePick Delta by clicking here. 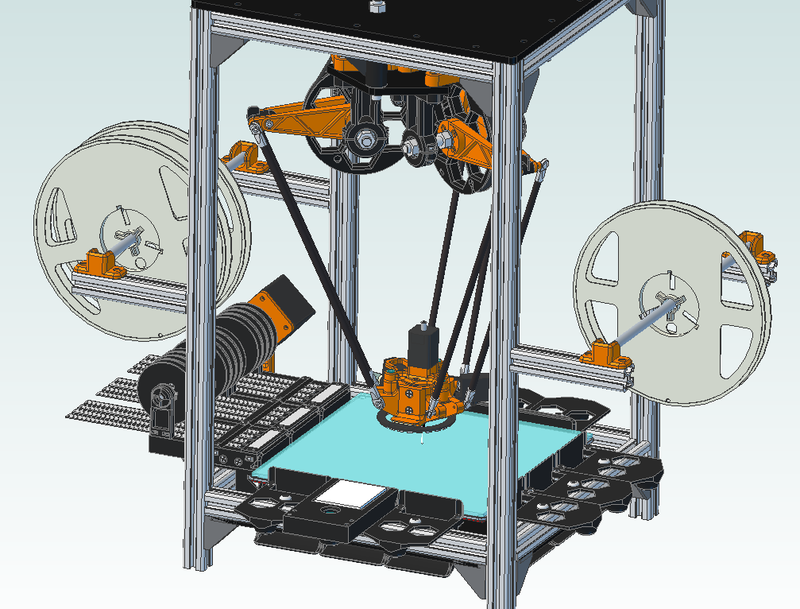 The "$300 Pick and Place / 3D printer" project featured on Hackaday Projects (and a quarterfinalist for the Hackaday Prize) is a machine called the FirePick Delta. What exactly is the FirePick Delta, and what (does and doesn't) it consist of? At a slightly higher level, the FirePick Delta is a combination of modular hardware and a software toolchain with an architecture that allows for easily extending to (and embracing) other hardware including (but not limited to) supporting different toolheads. Examples of this include not only the current pick-and-place and 3D printing toolheads, but also a solder paste dispenser (combined with machine vision to result in highly accurate dispensing) and others. The FirePick Delta can support multiple mounted toolheads, though only one is in use at a time. There is one more thing about FirePick Delta. Computer vision is built-in, and this visual feedback will be used to calibrate individual machines and compensate for differences between different units. In this way, the lack of mechanical tolerance can be compensated for with software. The FirePick Delta is designed at a high level to be capable of a useful range of automated assembly and manufacturing tasks. But more immediately and practically, it is for low to medium quantity Pick-and-Place operations (the term for populating printed circuit boards with surface-mounted components). Industrial pick-and-place machines are very capable but cost large-to-vast amounts of money and require expert operation and maintenance. Pick-and-place is not very cost-effective unless you are doing at least in the neighborhood of 500+ boards. This leaves a void in the market for small businesses and hobbyists doing small to medium quantities (10's to 100's) of surface mount boards, where currently the only assembly option is manual placement. The FirePick Delta is primarily a pick-and-place machine, but in line with its role as micro- or mini-factory it can also 3D print. 3D printing parts in ESD-safe plastic is a useful application for a machine that needs to handle raw components which can be ESD-sensitive. For example, printing your own tape-feeder hardware pieces. FirePick is a trademark owned by Karl Lew (a member of the FirePick Delta development team), whose own work culminated in FirePick1 - a non-delta based prototype unit. The FirePick software framework is open source and comprises multiple services designed to work together to enable mini- and micro-factories. The FirePick Delta is a delta-based implementation of FirePick. It can be thought of as the hardware platform which uses all major components of the FirePick framework, in addition to leveraging other open source software such as OpenPnP. It is collectively known as "FirePick Delta". FireREST - an open-source REST protocol for connecting and coordinating cameras, CNC machines, and browser GUIs in a flexible and extensible manufacturing network. This software is the glue that allows all the different hardware parts to communicate and be controlled in a standardized way. FireBOM - not actually part of the machine itself, but a tool to be used in conjunction with the FirePick Delta to create what can be thought of as a Bill of Materials with a bunch of extra useful knobs attached to it, including pricing, supply information, etc. All is open-source and made from the ground up to be extensible. Obviously people can do whatever they wish with the system, but if something is heavily modified from the originals or does not run the FirePick software with OpenPnP, it should have its own name and will not be called "FirePick". Right now FirePick Delta isn't YET a kit you can buy or a product you can purchase. That is coming! Right now it is in the prototype phase, and is in rapid development. One is "How to use the generic FirePick framework" - which will be of interest to people interested in hacking, extending, or otherwise modifying the system. 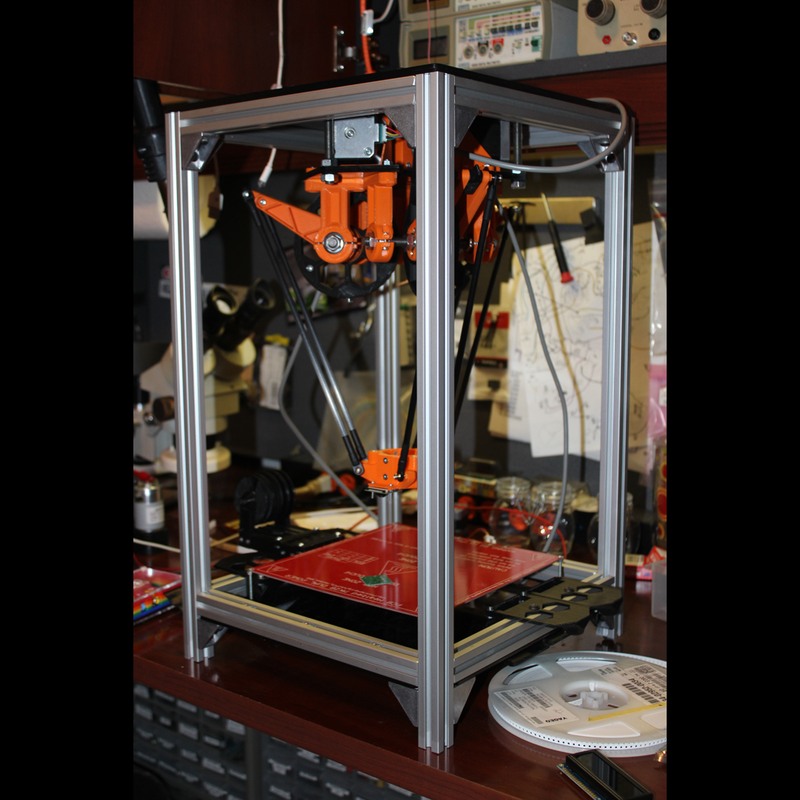 The other is the process of getting it up and running and using it to pick and place & 3D print in your workshop. That process, documented from a user's point of view, will begin shortly after the prototyping is complete and beta testing begins. In other words, end user documentation won't be left to leaving you puzzling through a series of disconnected and contradictory Google group posts. Accessible end user documentation isn't an afterthought, it has its own place in the development roadmap and you can count on it being made available to you along with the hardware. As of June 8, 2014 a FirePick Delta prototype has successfully picked-and-placed its first components. As of September 28, 2014, FirePick Delta is competing with 50 other projects for the Hackaday prize semifinals. Prototypes are using camera-based visual calibration and have demonstrated 3D printing using the printer toolhead. As of October 24, 2014 the FirePick Delta project was sadly judged no longer in the running for the Hackaday Prize. Development continues and is currently in Alpha - if you wish to build a unit from a rapidly-changing bill of materials with software under active development, join the Google Group and browse the github repositories. As of March 25, 2014 the FirePick Delta project will be entering Beta Testing with a group of beta testers around the world. This will happen over the next few months, and when it does things will start happening quickly. I am a Beta Tester and I will be responsible for end-user hands-on documentation of the project. Stay tuned! See all news about FirePick Delta by clicking here.